6.74 points at 19 votes (rank 425). 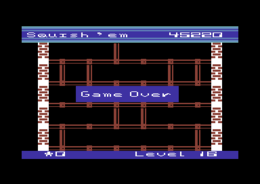 Rombachs C64-Spieleführer 6 September 1984 - "Vote 4"
The player steers a builder who must climb the half-finished steel structure of a 48-floor high skyscraper as unharmed as possible and find money bags, whereby he can only climb upwards. On all the beams there are small monsters, which can be treaded down (therefore the name of the game), but they regenerate after a short time and are then invulnerable. Furthermore these mean monsters drop bricks and tools from the top, which you have to avoid. The game takes place in a two-dimensional side view of a skyscraper structure. At the upper border of the screen is a bicoloured bar with the title of the game, to the right you can read the current score. The lower rim of the screen is rounded off with a unicoloured blue bar. Here you find at the left the remaining screen lives and to the right the current level of the game. 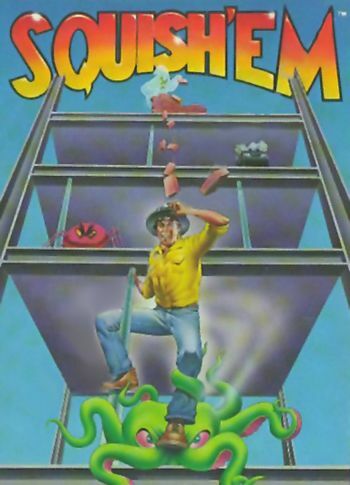 On each floor of the skyscraper there is exactly one monster. The type of monster within a level is always the same. If the player reaches another level after some floors, a short tune sounds and a new type of monster appears from now on on the next floors. From level 16 this limitation is cancelled and ALL types of monsters appear but still only one monster per floor. 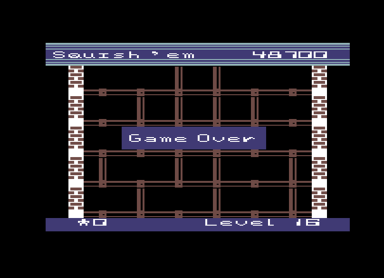 After each three absolved levels, the player reaches the roof of the skyscraper. There he finds a parachute with which he leaves the skyscraper on the "air path". Then you go to the next skyscraper and start from bottom again in a next level. After the start of the game, the title screen and after that a screen with the keys and the joystick controls is shown for a short time. After waiting a bit a demo game comes up. While the pawn works his way along the pillars of the structure from floor to floor, the screen scrolls automatically vertically upwards so the pawn always stays in the middle of the screen. It is not possible to climb down again. If the pawn is on one floor, it can move freely to the left and right. Thereby it must neither crash with falling items (tools, bricks, TV: just everything that people throw out of the window ;-) ) nor get in contact with the different monsters, because this leads to the loss of a life. You can also layway the pawn with tucked up legs over the monsters by pressing the fire button. However, the pawn only stays in this position for 1 second. The timing is therefore very important. What is left to notice is, that you find an item in the middle floor of each skyscraper that gets you an additional screen life. It is possible to disable the monsters ONCE. If you hang directly over a monster and let go of the legs, this will cause severe headaches on any type of monster :-) . After a short time span the monster will recover then and change its colour to white. Now it is not possible to knock out this monster again. Rombachs C64-Spieleführer: "Due to a lack of surprises and missing variation of the course of the game it gets boring soon (Vote 4).". Shakermaker303: "I didn't think it was that bad. Ok, the graphics are simple, the game sounds and the music are average (whereby I like the music, i.e. the monotonuous series of tones very much), but in principle it is well playable. It is no classic, but one should play it at least for a try, I give 8 out of 10 points." 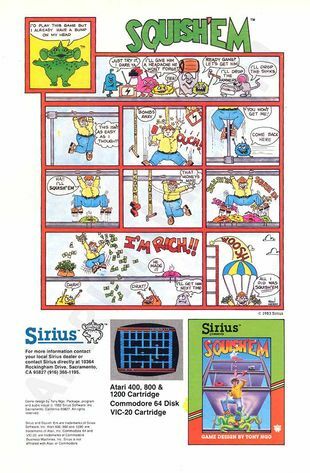 The "Gruds", the hallmark of Sirius Software, are only allowed in the title screen in this game.